Since humble beginnings in the 1960’s, Metal Halide lighting has grown to make up a substantial portion of the commercial lighting industry. In their early incarnations, metal halide lights utilized basic HID lamps driven by magnetic ballasts to produce a high lumen per watt ratio, and thus good energy efficiency, along with a very good light quality that few other forms of lighting could match. The commercial/industrial sector was quick to realize the benefits of metal halide lighting, and it wasn’t long before this form of HID luminary found its way into everything from warehouses and manufacturing plants to storefronts and parking lots. The energy savings and long life of the metal halide, combined with its high output, afforded an improvement in light quality that made the Metal Halide the lamp of choice for the majority of the industrial/commercial marketplace. Although the metal halide in its original form was a solid performer, there were still several issues that created problems with its practical use. Slow startup times, ballast failures, significant color shifting over the life of the fixture, and lumen output dropoff over time, increased the maintenance costs associated with metal halide lamps and reduced the effectiveness of their practical application. Much of the trouble with metal halide lamps stemmed from the magnetic ballasts used to manage the power fed to the lamp. Imprecise and subject to current fluctuations, these magnetic ballasts prevented the metal halide from reaching its full potential. Degraded operational lives, high lumen loss over time, color shifting, and sudden ballast failures reduced the cost effectiveness of metal halide lamps and increased maintenance issues associated with maintaining such HID systems. It took the integration of solid state technology into metal halide lighting systems to bring the true potential of these lights to its full effect. With the advent of solid state ballasts and pulse start designs, metal halide lamps quickly realized gains in efficiency and effectiveness that further cemented their popularity in the commercial lighting markets. By switching to electronic ballasts, HID systems now provide reduced warm up times, longer operational lives, and improved reliability that has reduced the operating costs associated with HID lighting. Additionally, the failure rate for electronic ballasts is far below that of magnetic versions, and the noise often associated with older magnetic ballasts has been eliminated. With the advent of solid state electronic ballasts, lumen output over the life of the metal halide lamp has been improved by up to 20%, giving most metal halide lamps an average lumen maintenance of 60-80% over the life of the bulb. With an increase in average lumen maintenance has also come a reduction in the color shifting associated with the aging of the lamp, and the variances in color quality between lamps. This means light quality is better maintained over the life of the unit, while light quality differences between the multiple units often installed in commercial/industrial applications is reduced. Electronic ballasts have also worked to improve the efficiency of the metal halide lamp, allowing up to a 15% increase in unit efficiency over lamps equipped with magnetic ballasts. Finally, electronic ballasts have added the ability to precisely control operation of the HID lamp, providing faster startup times and reduced downtime between powering cycles, and in some applications, actually allowing the metal halide lamp to be dimmed like a traditional incandescent lamp. Although improved lumen maintenance is often considered the prime benefit of metal halide lamps equipped with an electronic ballast, it can also be argued that the reduced size and weight of the electronic ballast as compared to magnetic units has opened the metal halide to a wider range of applications. With electronic ballasts providing up to 80% lumen maintenance over the life of the metal halide bulb, it is certainly a benefit for the cost conscious operator who must seek the most efficient operation over the long haul. However, with metal halide lamps utilizing electronic ballasts, it is now possible to apply this HID lighting to applications where compact size and light weight is a must. Once applicable only to large scale applications such as manufacturing due to their large size and considerable weight, electronic ballasts have allowed the metal halide and other forms of HID lighting to be scaled down in size and utilized in the smaller applications found in applications such as automotive, marine, and portable lighting. This electronic ballast technology has allowed the metal halide to be introduced into areas such as portable lighting with great success. Before the advent of compact metal halide lamps, portable and mobile lighting applications relied on older technology like the filament based incandescent lamp, which was inefficient and low in overall light output. 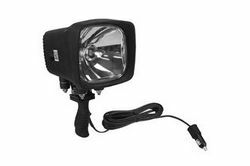 With compact HID systems, however, the high power and efficiency of the metal halide is now available for use as boat lighting, automobile headlights, and even portable handheld spotlights like Larson Electronicss’ 70 Watt Metal Halide Handheld Light. High powered, durable, and drawing less power than the traditional incandescent halogen lamps they replace, these compact metal halide lights provide the highest light output possible while allowing extended runtimes with the limited power supplies encountered in stand alone and portable applications. Along with increasing the range of applications for HID lighting, this improved versatility has allowed military, law enforcement, industry, and even private operators to improve the safety and effectiveness of their operations without creating undue expense. Mounted to vehicles, HID lighting has provided power and reliability that has improved the effectiveness of law enforcement operations while improving officer and public safety as well. In military operations, the sheer power and reliability of HID metal halide lighting has allowed units in the field to illuminate larger areas, at greater distances and with improved clarity and detail, all of which adds up to improved effectiveness and safety as well. For boating, metal halide lamps provide spotlight power and effectiveness that no halogen lamp can match. Identifying markers, illuminating potential obstacles and debris, and providing powerful illumination in emergency situations, metal halide lamps give boaters the security of high power illumination in a compact and low power requirement lighting option. With the advent of electronic ballasts, metal halide lamps have now reached the upper limits of their true potential. Although it is true that newer technology such as LEDs offer to provide increased durability and efficiency in the near future, it is generally agreed among experts that it will be some time before such technology will be able to rival the metal halide for sheer light output. For applications that require the most power possible, with the best efficiency possible, there is little that can compete with the modern metal halide.